On the last day in July, I'm pleased to show you my Blue Yuletide Jewel, my third "Christmas in July" project. I love the Maritime look of this Blue Jewel. I've always wanted to do a small Christmas project in blues. This project can hang on a door or wall and it depicts the shape of a Christmas ornament. But it's a great size (18 x 26) to put on a little table to use as a table mat. I haven't decided how I will finish it. So that's it, I've done 3 really nice Christmas projects. They all need to be machine quilted, and each one won't take very long. But I will give thought over the next few weeks as to the free motion designs I will use on each.... 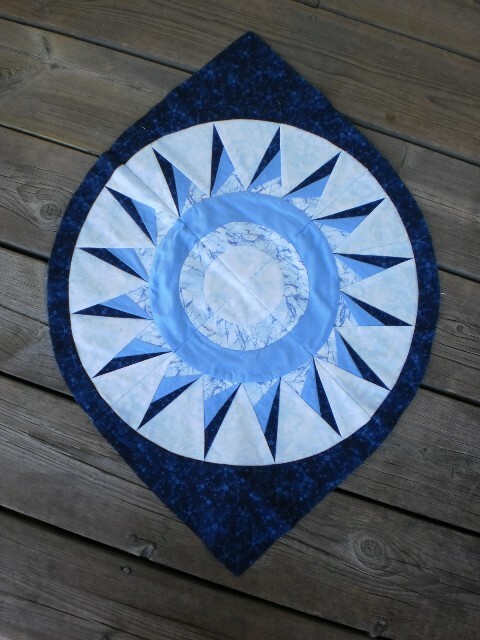 I hope to have the Christmas Sugar Cookies table runner and this Blue Yuletide Jewel quilted by early September. I know some will ask about this pattern. This is one of Karen of Sew Karenly's designs and she recently did the Jewel in a very different set of Christmas fabrics/colors. Go have a look here. And to see Karen's original pattern colors, or if you'd like to make your own Jewel, go to Karen's pattern page to see/order the pattern. It is beautiful! Good for you on getting Christmas things made early. Very nice in blue. Love it! Looks lovely, Gail. 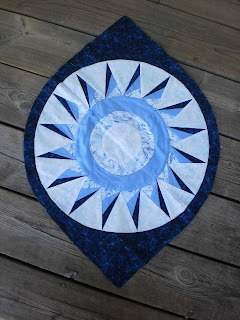 I can see it quilted with some silver metallic or halographic threads to add a little shimmer! The weathered boards make a terrific background for your picture. Thanks for the plug, and for doing such a great job!